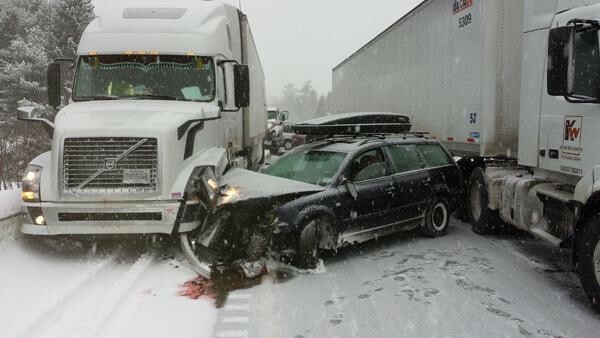 Interstate 95 northbound between Newport and Bangor was shut down Wednesday morning due to a pileup involving more than 40 vehicles. Photos from state police show a crash Wednesday morning troopers say may involve more than 40 vehicles. Peggy Leonard's vehicle was wedged between 2 semis in the 40-vehicle pileup on I-95 Wednesday morning. 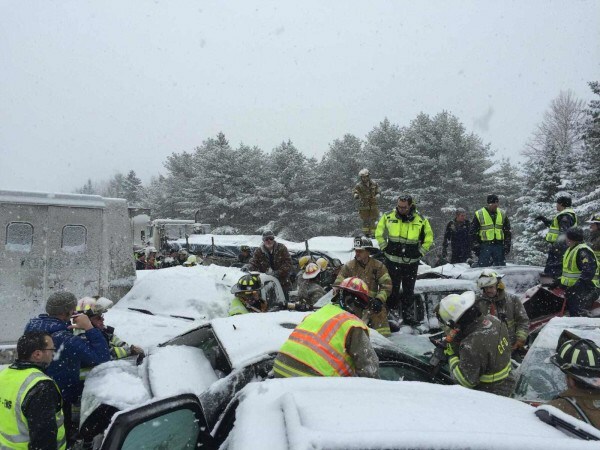 This photo from the pileup on I-95 in Etna came courtesy of Bouchard & Sons Towing. Northbound traffic on I-95 is backed up north of Newport after a Wednesday morning crash involving more than 40 vehicles. Jake Ward, left, and Ken Buckley look at a pileup on Interstate 95 northbound from the Cook Road overpass Wednesday morning in Etna. Interstate 95 northbound is closed between Newport and Bangor due to a crash involving more than 40 vehicles. 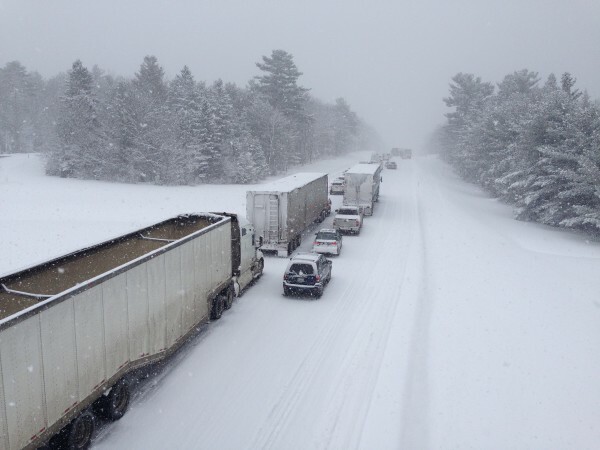 Interstate 95 northbound is closed between Newport and Bangor due to a crash involving more than 40 vehicles. 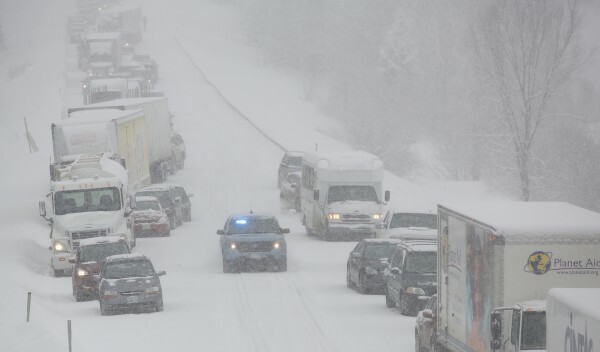 Interstate 95 is shut down due to a crash involving more than 40 vehicles, according to Maine Department of Public Safety spokesman Stephen McCausland. 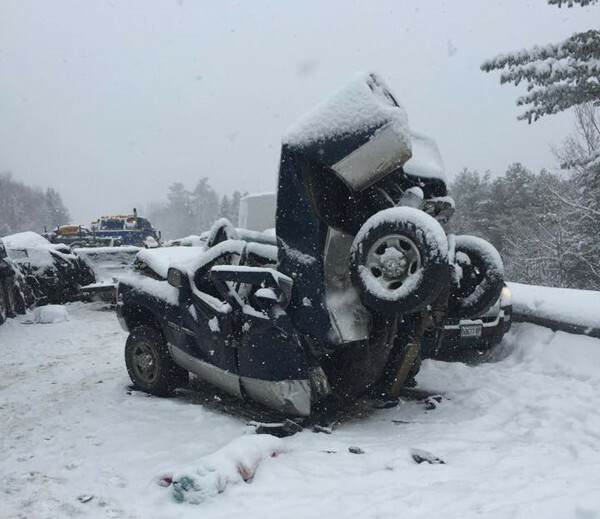 CARMEL, Maine — Interstate 95 was shut down to northbound travel between Newport and Bangor for more than four hours Wednesday after a crash involving more than 70 vehicles occurred on the slippery highway, according to Maine State Police. At least 17 people were taken to Bangor hospitals, according to officials at the medical facilities. Both northbound lanes were closed soon after 7:30 a.m. One lane reopened to traffic at approximately 11:30 a.m.
McCausland said the main crash involved more than 25 vehicles, and a series of other wrecks leading up to the crash site occurred. “Some of those other crashes involved two or three vehicles each, and then other vehicles went off the road to avoid collisions,” McCausland said in a statement at 10:50 a.m.
Eleven patients were taken to Eastern Maine Medical Center in Bangor, some with broken bones and others with more serious injuries, Dr. Jim Clarke, chief of surgery, said just before noon. “It’s our impression that none [of the injuries] are immediately life-threatening,” he said. He did not provide specific information about injuries, names or ages of those hurt for privacy reasons. Other patients were taken to St. Joseph Hospital, EMMC staff said. The American Red Cross set up a hot line for anyone concerned their loved one might have been involved in the crash. EMMC set up an area for family members and friends of patients to gather. EMMC staff heard about the collisions about 8 a.m. and initiated their mobile incident command “for the possibility of mass casualties,” Clarke said. 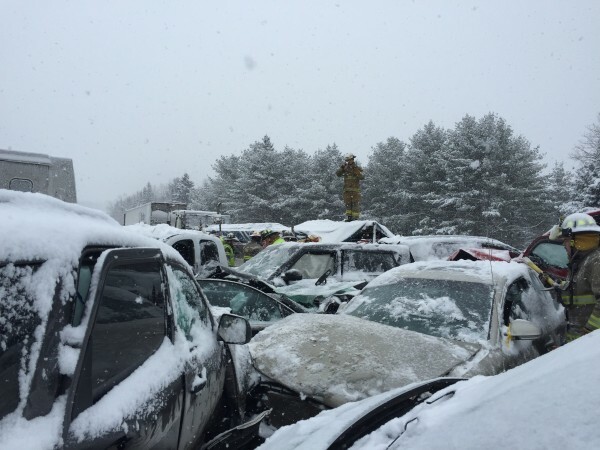 Amy Kenney, spokeswoman for St. Joseph Hospital in Bangor, said the hospital initiated a “code triage” after learning of the pileup. As of late Wednesday morning, six patients were transported from the crash site to St. Joseph, according to Kenney. “Coordinated efforts began immediately with Eastern Maine Medical Center to ensure communication of available community health care resources,” she added. Conditions of St. Joseph’s six patients weren’t immediately available, but they were being “assessed and treated within the Emergency Department,” according to the hospital. The hospital expects at least one person could be admitted in the near future. One vehicle was a bus carrying two RSU 19 students and an aide to Stillwater Academy in Old Town. One of the high school students has a scraped chin and one may have sprained a thumb, RSU 19 Superintendent Greg Potter said, but the driver and aide were uninjured. The bus was unable to stop before hitting one vehicle and then another vehicle hit the bus from behind. “There are over 20 vehicles surrounding the bus,” Potter said of the multi-vehicle crash. The collisions caused one tire on the bus to deflate, but Potter did not yet have an estimate for the amount of damage. The school district sent a bus to the scene to act as a warming center for those stuck on the highway and a van picked up the students to return them home for the day, according to Potter. “We’re feeling very fortunate,” Potter said. A Bangor police detective was among those who had his vehicle totaled in the crash, Sgt. Tim Cotton said in a posting on the department’s Facebook page. According to Cotton, Detective Larry Morrill stayed on scene to assist other law enforcement officers helping victims from their vehicles. The collisions started occurring around 7:30 a.m. Wednesday as heavy snow started to fall in the area. A fleet of wreckers continued to remove damaged vehicles on Wednesday afternoon. Peggy Leonard, who was heading to her home in Hampden at the time of the accident, said she feels fortunate to be alive after her vehicle wound up wedged between a pair of tractor-trailers. Leonard added she believes there were about 30 vehicles in front of her. “I have never seen anything like this in my life,” she said. The crash involved many cars, the school bus and several tractor-trailers. McCausland said. 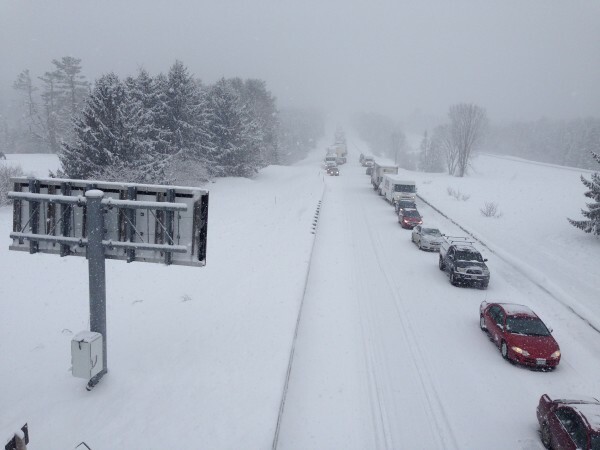 Dozens of vehicles were stuck behind the pileup for nearly four hours. 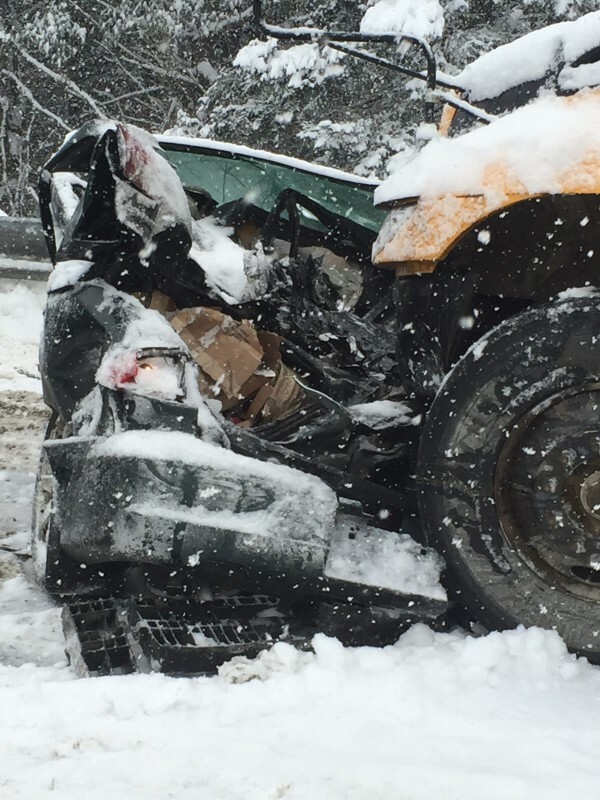 Matthew Theriault, a 24-year-old contractor and guardsman, told the Bangor Daily News he was one of the first drivers to come to a stop behind the pileup. “People in the left lane were going way too fast for conditions,” Theriault claimed. The speed limit on the interstate had been reduced to 45 mph. Theriault said he was driving about 40 mph, but he estimated some of the vehicles passing him were traveling in excess of 60 mph. Those stuck behind the wreckage got out to check on injured drivers and handed out whatever blankets they had after state police arrived. 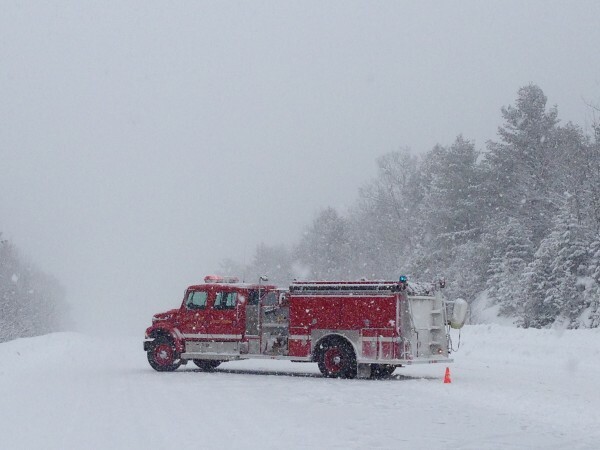 Most vehicles have moved to the right to allow plow and tow trucks to pass so the snow and wreckage can be cleared. 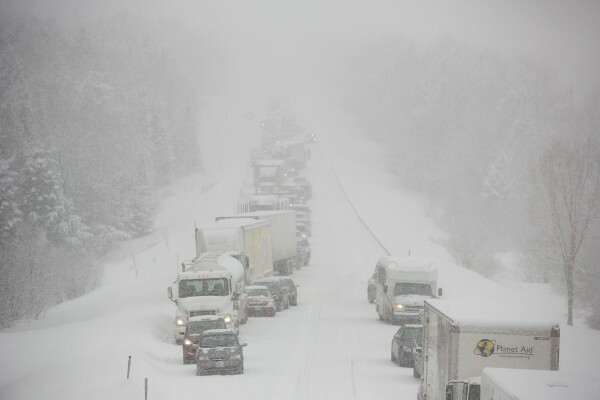 An hour later, Theriault said that the line of cars behind the pileup was allowed to leave, following a plow truck through the wreckage and to the interstate beyond. BDN writers Ryan McLaughlin, Nick McCrea and Nok-Noi Ricker contributed to this report. Correction: A previous version of this story said the crash occurred in Etna. The crash occurred in Carmel.